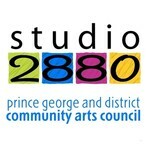 The Community Arts Council of Prince George & District was established in 1968 to respond to a growing consciousness of the value of expanding the reputation of Prince George district artistic endeavours in both a provincial and national context. The community arts council has been a vital component of the Prince George district for almost 50 years. Since its founding, the community arts council and its members have been providing a wide range of services and programs that have helped contribute to the spirit of innovation, ingenuity and open-mindedness that defines the Prince George district. Our artists, performers, ensembles, artisan guilds and cultural organisations represent city residents from all walks of life. The heart of our organization has been located at Studio 2880 for the past forty years. These facilities have become a destination for people who wish to purchase locally created artworks, and access and benefit from the unique educational programs and services offered there. The year 2016 is a celebratory year for us, with it being our 40th anniversary of being located in Studio 2880, concurring with our upcoming 40th anniversary Studio Fair, a signature three-day event here in our region. Art impacts all of our lives, and for almost 40 years our home has been at Studio 2880. Our Arts Council supports Music, Pottery, Painting, Dance and much more. Our artists are giving back, now is your turn, by donating to help us maintain Studio 2880.